Calm unruly locks with the OUAI Smooth Conditioner; an award-winning, frizz-fighting formula developed by celebrity hair stylist, Jen Atkin. 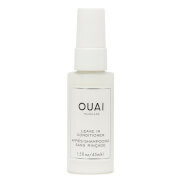 The lightweight conditioner glides onto frizz-prone locks; smoothing, soothing and hydrating each fiber. Utilising OUAI’s ‘Smart Technology Complex’, the conditioning formula is infused with an effective blend of naturally-derived oils, which work to calm disobedient tresses, without weighing them down. Enriched with a reviving scent of Italian Lemon, Bergamot, Rose and Blackberry, the calming conditioner thoroughly nourishes and tames locks, leaving hair smooth, sleek and frizz-free. Free from parabens. Not tested on animals. Aqua (Water, Eau), Cetearyl Alcohol, Behentrimonium Chloride, Cetyl Alcohol, Amodimethicone, Cetyl Esters, Hydrogenated Ethylhexyl Olivate, Butyrospermum Parkii (Shea) Butter, Jojoba Esters, Oryza Sativa (Rice) Bran Oil, Cocos Nucifera (Coconut) Water, Panthenol, Glycerin, Tocopherol, Phyllostachis Bambusoides Juice, Tamarindus Indica Seed Gum, Daucus Carota Sativa (Carrot) Root Extract, Hydrolyzed Hibiscus Esculentus Extract, Jasminum Officinale (Jasmine) Flower Extract, Nasturtium Officinale Extract, Helianthus Annuus (Sunflower) Seed Extract, Helianthus Annuus (Sunflower) Extract, Zingiber Officinale (Ginger) Root Extract, Amaranthus Caudatus Seed Extract, Moringa Oleifera Seed Extract, Hydrolyzed Linseed Extract, Pisum Sativum (Pea) Extract, Cynara Scolymus (Artichoke) Leaf Extract, Oryza Sativa (Rice) Bran Extract, Rosmarinus Officinalis (Rosemary) Leaf Extract, Alanine, Arginine, Glycine, Histidine, Isoleucine, Phenylalanine, Proline, Serine, Threonine, Valine, Aspartic Acid, Laurdimonium Hydroxypropyl Hydrolyzed Keratin, Hydrolyzed Rice Protein, Hydrolyzed Corn Protein, Hydrolyzed Yeast Protein, Zea Mays (Corn) Starch, Hydrogenated Olive Oil Unsaponifiables, Isododecane, Ethylhexylglycerin, Propanediol, Parfum (Fragrance), C11-15 Pareth-7, Hydrolyzed Vegetable Protein PG-Propyl Silanetriol, Cystine Bis-PG-Propyl Silanetriol, Sodium PCA, PCA, Diisostearyl Malate, Stearamine Oxide, Cetrimonium Chloride, Laureth-9, Trideceth-12, Polysilicone-15, Leuconostoc/Radish Root Ferment Filtrate, Sodium Lactate, Polysorbate 60, Pentylene Glycol, Hydroxyethylcellulose, Guar Hydroxypropyltrimonium Chloride, Pentaerythrityl Tetra-Di-T-Butyl Hydroxyhydrocinnamate, Tetrasodium EDTA, Citric Acid, Aminomethyl Propanol, BHT, Caprylyl Glycol, Phenoxyethanol, Chlorphenesin, Benzoic Acid, Benzyl Alcohol, Sorbic Acid, Alpha-Isomethyl Ionone, Limonene.